James Harris Gallery | "REFLECTIONS FROM A DAMAGED LIFE"
"REFLECTIONS FROM A DAMAGED LIFE"
James Harris Gallery is pleased to present our first solo exhibition by Los Angeles artist Daniel Joseph Martinez. This is the third project Martinez has shown in Seattle and a welcome return after 23 years. Throughout his career, Daniel Joseph Martinez has engaged in an interrogation of social, political, and cultural mores through artworks that have been described as nonlinear, asymmetrical, multidimensional propositions. The works, ranging from the solid to the ephemeral, are executed in a wide range of media, including text, sculpture, photography, painting, installation, robotics, performance, and public interventions. Ongoing themes in the work are contamination, history, nomadic power, cultural resistance, war, dissentience, and systems of symbolic exchange, directed toward the precondition of politics coexisting as radical beauty. The exhibition consists of three distinct bodies of work crafted around a conceptual framework exploring issues relating to the military-industrial-political complex, religion, advertising, social issues and consciousness. Though distinct in subject matter they unite overarching themes that question the preconditions of the current state of both US and global politics. “A story for tomorrow in 4 chapters,Dostoevsky loved the Hunchback of Notre Dame, Muhammad Ali and Dandelions, Lick my hunch” consist of four large-scale photographs in which Martinez uses his own body mutated and visceral broken as sociological commentary. 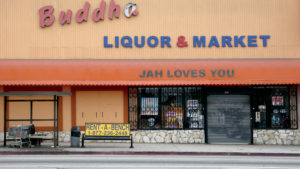 A portfolio of twelve documentary photographic prints depicting images of businesses around the artist neighborhood where he lives entitled “Field notes from South Los Angeles; this world is a fleshless one where madness,love and heretics are all I know.”And “NATO is a subsidiary of Boeing: Night Of The Day Of The Dawn Of The Son Of The Bride Of The Return Of The Revenge Of The Terror Of The Attack Of The Evil, Mutant, Hellbound, Flesh-Eating, Crawling, Alien, Zombified, Subhumanoid Living Dead — Part X-45B” a multi-disciplinary installation consisting of text, photography and sculpture that critiques the Boeing Corporation’s intimate relation with the 28 members of NATO. As you enter the gallery, a flesh colored neon sign “Eat The Body of a Dead Murder” sets the tone for the exhibition. In the first gallery, the viewer is confronted by four large scale photographic images of the artist, masked, wearing simple trousers held up by a rope belt and naked above the waist revealing a hunchback. In two of the photographs a papal hat is worn. Martinez also is shown kneeling on an Islamic prayer mat. 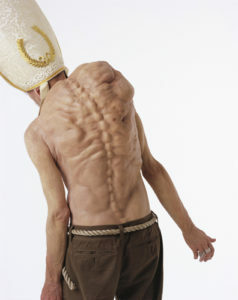 Martinez’s photographs of hunchbacks in these various guises transform the idea of a “monstrous” outsider into an avatar. An avatar whose sole purpose is a foil to human responsibility that contributes to the social fabric of everyday modernculture. The photographs are not hung on the wall but sit on the floor and lean against them; a deliberate gesture that reflects the fallible hope or religion and the human condition. 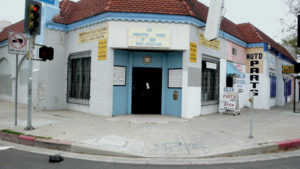 The scale and subject matter shifts in the next room where twelve photographs of the Crenshaw neighborhood in Los Angeles, home to the Rodney King Riots and the location of Martinez’ home and studio. Now the images are devoid of people, ghostly absent but loaded with human signifiers of another sort: signs, graffiti and the architecture of commerce. 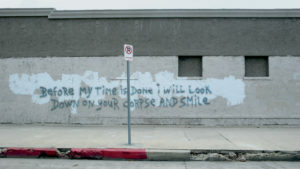 The artist has made textual interventions in some of the photographs. 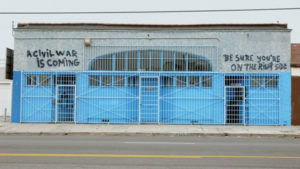 The combination of spray painted commentary combined with commercial signage questions authorship and collapses the distinction between self and others. Zombie films project the future of modern and apocalyptic events by using past trauma, anxiety and hysteria. Hailed as one of the best examples of zombie films to critique historical events is George Romero’s ‘Night of the Living Dead.” Similarly, Martinez derives meaning from the philosophy of zombies as hypothetical beings that are indistinguishable from normal humans except in that they lack conscious experience. It is from this discourse and leading thinker, Christof Koch, that Martinez again donned a mask to address post human consciousness. 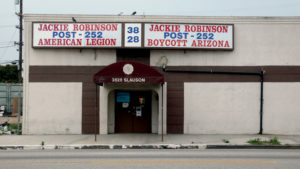 A row of marquee directories; aluminum frames containing black panelswith white text and Polaroids of zombie heads, wrap around the hallway and the back gallery.These twenty-eight marquees announce the titles of zombie filmsalong with language by the artist to push visual experience into an arsenal of poetry, advertising, fiction, politics, terrorism and even love. 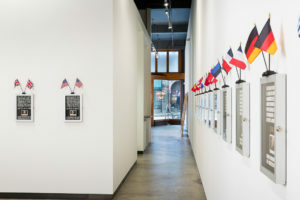 Art and language as form present the ability to create a unique opportunity to use past, present and future history with autonomy.Atop each framed assemblage of text and image are flags representing the NATO countries. 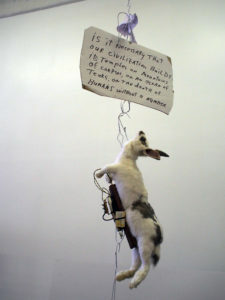 In the center of the room hangs a mobile sculpture consisting of text, a taxidermy hare with a bomb strapped to it and a taxidermy trout with a model of a stealth bomber trapped in its mouth. The concept of a machine acting like a human being without having consciousness dates back to Rene Descartes; the term “zombie” within a philosophical context was introduced by Robert Kirk in 1975. The exhibition is a culmination ofimages that linger on in our memory and consciousness. An awakening of ideas though image and text. Martinez has always created work to function as criminal, or subversive; the artist strives to reorganize the textual logic to become a visual logic unrecognizable from its origins. He questions the possibility to visualize an ethics of being, to some extent a visualization of tangible ethics that has been reworked and manipulated.The three distinct rooms share an absence of humanness as a subject matter, but Martinez intent is to imbue the opposite; artworks that compels action, opens dialogues, pushes authority and stimulates consciousness. 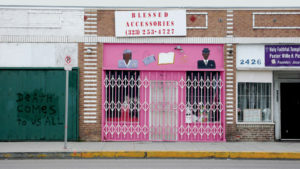 Daniel Joseph Martinez’ recent exhibitions include The Past Is Present, Museum of Contemporary Art Detroit, Detroit, MI; In the Good Name of the Company, For Your Art, Los Angeles, CA; NYC 1993: Experimental Jet Set, Trash and No Star, The New Museum, New York, NY; No Way of Life is Inevitable, FLORA ars+natura, Bogota, Columbia; The Symbolic Landscape: Pictures Beyond the Picturesque, University Art Galleries, University of California Irvine, Irvine, CA; Print/Out at the Museum of Modern Art, New York; I want to go to Detroit; Cheerleaders CHEER, LAXART, Los Angeles, a solo exhibition in conjunction with Pacific Standard Time; Divine Violence Installation, Site Santa Fe Biennial, Santa Fe; The Artist’s Museum: Los Angeles Artists, 1980-2010 at the Museum of Contemporary Art, Los Angeles, CA; and A Meditation on the Possibility of Romantic Love; or, Where You Goin’ with That Gun in Your Hand: Bobby Seale And Huey Newton Discuss the Relationships between Expressionism and Social Reality Present in Hitler’s Paintings, Istanbul Biennial, Turkey. Martinez was included in the Aperto exhibition at the 1993 Venice Biennale and two Whitney Biennials in 2008 and 1993 where the artist’s Museum Tags: Second Movement (Overture); or Overture con Claque (Overture with Hired Audience Members) stated I Can’t/Imagine/Ever Wanting/To Be/White, which were subsequently featured on the cover of Artforum magazine on two separate occasions; once as the cover for the 1993 Whitney Biennial edition and once as the cover for Best of the 90s December 1999 edition. 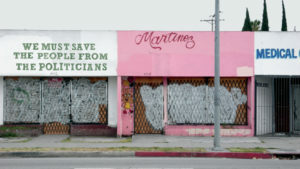 Martinez’ work has been the subject of four monographs to date, including the monumental retrospective monograph published by Hatje Cantz in 2009. Martinez represented the United States in the American pavilion in the 2006 Cairo Biennial, and was included in the 2007 Moscow Biennial, and the 2010 La Biennale de Quebec, Quebec City, Canada. His work can be found in numerous public collections both in the United States and abroad including the Whitney Museum of American Art, New York, NY; the Museum of Modern Art, New York, NY; Los Angeles County Museum of Art, Los Angeles, CA; Museum of Contemporary Art, Los Angeles, CA; Orange County Museum of Art, Newport Beach, CA; Cisneros Fontanals Art Foundation, Miami, FL; Museum of Fine Arts, Houston, TX; and the Linda Pace Foundation, San Antonio, TX. In 2014 Martinez completed a project with MoMA, New York and was included in the Site Santa Fe Biennial, Santa Fe, NM.